Perfect for making an excellent cup of tea and comes with a convenient cup for dripping tea leaves! 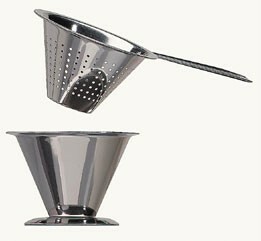 Use this tea strainer when tea leaves are placed loose in a tea pot. Once the tea has steeped, simply hold the stainer over a tea cup and pour tea into the strainer. Your prepared tea will pass though the stainer while all the tea leaves will remain in the strainer, making for a perfect cup of tea. After your tea has been dispensed place the strainer in the included storage cup, keeping the dripping tea leaves cleanly stored.